I went for a walk in the woods today, keeping my eye out for foragy-type things. I have it in my head right now to find locust tree flowers, but I am always looking for morels after a friend found some in his backyard recently. (Talk about envy...) What I came away with is sassafras root. Using Hank Shaw's recipe for root beer syrup, I made a batch. I did not have any burdock root, and I'm still a little shaky on what burdock is, so I figured I'd proceed without it. In his cookbook he says that's fine. However, at the last minute I discovered I don't actually have peppermint extract in the house. If I'd saved the wintergreen berries I'd found last weekend I could have popped those in but, no. So I used a peppermint candy. Close enough. A little extra sugar won't hurt, right? The other change is that I'm attempting to can it, like other syrups, rather than just store it in the fridge. So I put the syrup in pint jars (4) and processed it for 10 minutes in the boiling water canner and let it rest for 5 before removing it. 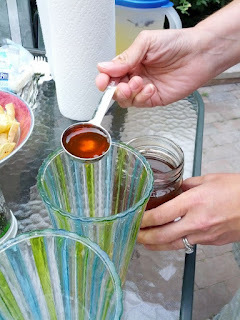 We had an opportunity to use the syrup: 4 T. with seltzer was just right. I also brought home a few leaves so will try drying them in the oven overnight to make file powder. Not that I've ever used file powder, but it might come in handy someday. Licking the pot suggested that it tastes pretty much like root beer soda, and that is a good thing. It did, and I still have a jar of it. I have canned other syrups this way and they all last a very long time. Go for it!